Hat’s off to Mary Belcher. A group she organized has been diligently restoring and documenting upwards of 10,000 persons who were buried in the Adams Morgan section of Walter Pierce Park in the District of Columbia. Photo: Mary Belcher. Credit: WJLA-TV (District of Columbia). Over time the old grave markers have deteriorated and been lost. Mary’s group is using the older records and evidence found on the site to document each person buried there. No small task. 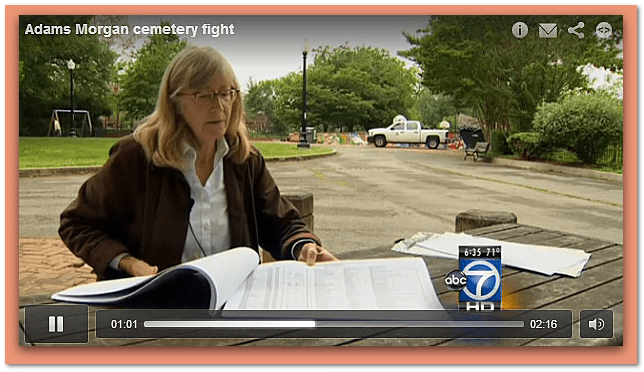 Watch this news report from local television station WJLA-TV to see what Mary and her group have accomplished so far in their cemetery restoration efforts. GenealogyBank’s Genealogy Database Grows Every Day! In your spare time (lol) could you advise me on how to get a group started locally and how I can obtain copies the burial records. The local lady handling the records has it all on computer but will not allow me access. Just when I was feeling generous and wanted to do something for others on ‘Find A Grave’. Any advise will be appreciated. By the way, I’m located in Louisiana. Dorothy – why not go to your local public library or to your area Family History Center. You can accomplish a lot of research there. In what city do you live? Margaret: You might want to start your own project. 1. Go with your digital camera to your local public cemetery and start taking photos of each tombstone. Systematically go down each row. 3. You should be able to read each stone to get the information – but when the carved words are no longer visible – you could skip it in your initial documentation of the cemetery. 4. Keep careful notes of the tombstones you skip so that you can later research and determine the information on the person who was buried there. Note the names of the persons buried next to and adjacent to the unidentified stone – those can be valuable clues for determining that person’s identity. Work with your local genealogical or historical society and see what suggestions they have. Please let us know what you are able to accomplish. Our efforts have been community-driven. Our thought toward protecting the cemeteries is: If we didn’t do it, who will? I know what it’s like not to have any money to do research. But sometimes there are academic institutions willing to help, because it is so important to us all to reconnect to our history and out ancestors. In our case, our good friends at Howard University helped us, and that, in turn, helped us get some outisde grants so that we could continue our work at Walter Pierce Park. By the way, I’m a devoted subscriber and fan of genealogybank.com. The source I use most is your newspaper archives, which has helped us beyond measure in understanding the depth of the history at Walter Pierce Park.